I am pretty sure my temps would be widely different. It could be the grill is a Genesis 1000 and 24 years old, so the lid thermometer probably isnt real accurate. My Smoke came in yesterday! Can't wait to put it to the test next week on the behemoth 22.59 lb. turkey! I've already hinted to my girlfriend that the Smoke Gateway would be a pretty cool Christmas gift. LOL. Good luck. That is a huge bird and will be a great use and test for your new smoke. I can't imagine it will disappoint you. Let us know what you think after the big cook. Thanks, Bruce. I'll definitely post my thoughts -- whether good or bad! -- a few days later. I'm cooking for a decent amount of people, so we'll see how it goes. Thinking about just sticking the lines/probes through the grommet. Any advice/issues on that in regards to avoiding the grommet coming out upon entrance/removal? I hated trying to get it in there. No advice on the grommet from me. I use a Genesis 1000 gasser. I've never had an issue with it. If you're really concerned about it, put a little vegetable oil on the probe. Only advice would be to NOT put any significant strain on the cord when pulling it out. You'll have to put some strain on it to pass it through, but as soon as there's any resistance, stop and push from the other side. The ThermoWorks probes are a lot sturdier than most other brands but you still shouldn't be pulling hard on the cord. I just got my Smoke yesterday, got the white one. Can't wait to use it, very impressed with how easy it is and how well the probes are built. Yup, just got the grey one in this week taking advantage of the 15% off sale. Can’t wait to put the Smoke and my new DigiQ DX2 through its paces this weekend! Well, it looks like I never got around to closing the loop on this review after receiving and trying the Smoke Gateway and smartphone app. The folks at ThermoWorks sent me a gateway to try and I used it when cooking the brisket featured in the Whole Brisket - Central Texas Style Butcher Paper article in September 2017. Perhaps one of the reasons I forgot to post the review was because using the gateway was not a memorable experience! It was simply a matter of downloading the ThermoWorks app to my iphone, going through a simple registration process on the app to create an account, and then pairing the gateway with the app. I don't recall having any problems with the process, and I was monitoring the brisket and pit temp in short order. It's my understanding that some (many?) people have complaints about the ThermoWorks app. If you look at comments on the Google Play store, lots of folks seem to have connection problems. Reviews on the iTunes app store are mixed, some liking it, some complaining. I didn't have very high expectations of the app, so it seemed to do what I wanted, e.g. showed the temps, graphed the temps, etc. and I didn't lose my connection between Smoke and my iPhone. The only confusion for me was how to download the graph data after the cook. Turns out you have to save your cooking session to the "Saved Graphs" folder (if you don't, your next cook's temp readings will be appended to the end of your previous one) then you can export it as a .csv file and import that into a spreadsheet. So in retrospect, I have to say that Smoke + Smoke Gateway seems like a solid combo to me, at least as an iPhone user. 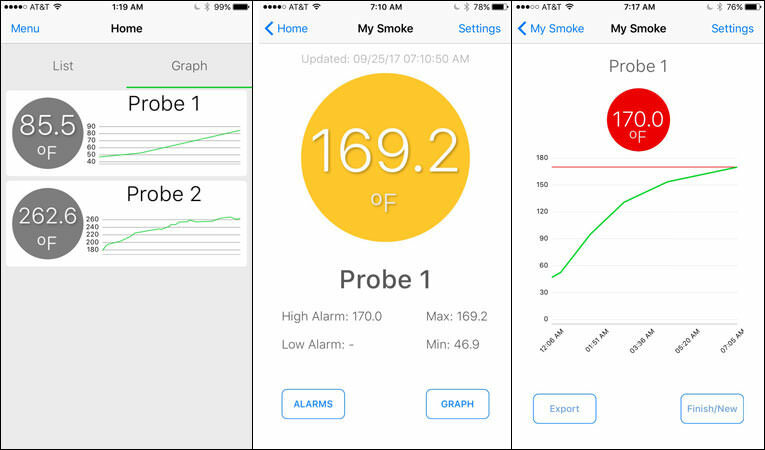 As you may know, since I wrote the original review of Smoke, there is a new product called ThermoWorks Signals that features four temp probes (e.g. 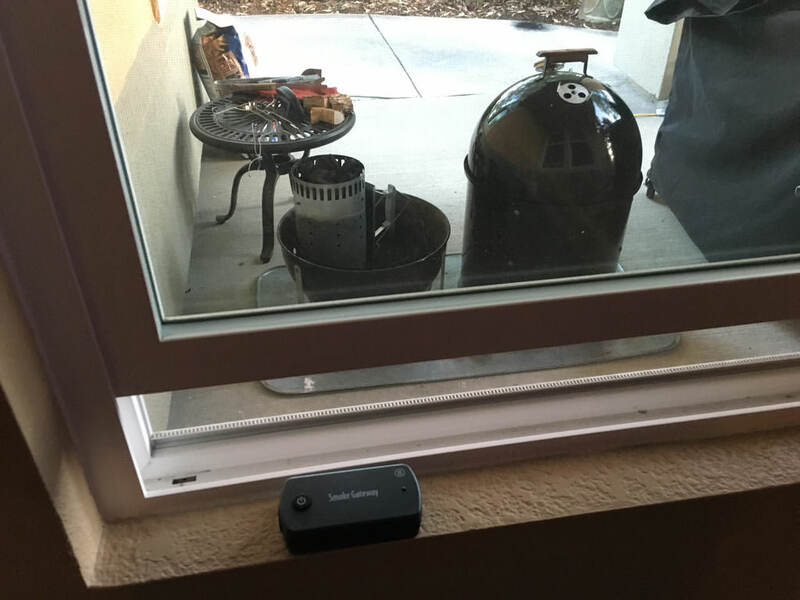 three meat probes, one pit probe), Bluetooth connectivity to a smartphone built-in, and WiFi gateway connectivity to a smartphone built-in...no need to purchase a separate gateway component. However, Signals depends on your smartphone for remote temp monitoring, it does not utilize the handheld receiver that comes with Smoke. So if you're into competition barbecue or you're a backyard barbecuer that like to measure the temp of several meats at once, you might consider Signals instead of Smoke. Disclosure: ThermoWorks provided TVWB with a Smoke Gateway for the purposes of this review. The opinions expressed above are my own and have not been reviewed or approved by ThermoWorks.